That is, do you find it easy to set money aside? Or do you enjoy spending money? Well, whether you’re a spender or a saver, interest rates affect you either way. Are you already paying interest? Probably. Anyone with a loan or credit card does. Do you earn it? Again, it’s very likely you do, if you have a savings account. The truth is, interest rates can influence almost every economical decision you make. From your banking, to buying a car, a home, setting up a business or even studying. But have you ever asked yourself how do interest rates work? And why you should care? Interest rates are basically the value of money. Basically, the price you get charged to borrow money or lend it out. For a lender, it’s the return you get for lending your money out. It is the incentive and reward you get for taking the risk of lending money. For a borrower, it’s the price you pay to bring your spending forward. For example, getting to buy things you want now instead of having to wait until you’ve saved enough. The good thing is that in a sense, anyone can be a lender and receive interest for their money. So consumers need to borrow money, but banks, governments and companies also need to borrow cash. That’s why if you put money in your savings account or lend it out, you’ll receive a reward for taking the risk. Interest rates are usually shown as an annual percentage. Therefore, if the yearly interest rate is 10% and you borrow $1,000, then by the end of the year you will owe $1,000 plus 10% annual interest, a total of $1,100. The same is true if you are lending out. If your savings account pays 10% annual rate and you deposit $1,000, after one year you will have $1,100 in your savings account. What determines interest rates in Australia? The Reserve Bank of Australia (RBA), Australia’s central bank, sets the cash rate. The cash rate is the rate that the central bank charges other banks on overnight loans. To set the cash rate, the RBA looks at different economic factors and reviews them periodically. Well, here are some of the many indicators. Inflation, which is the increase over time of goods and services. That is, a dollar today is worth less tomorrow. In a growing, strong Australian economy, inflation always rises and wages should rise at the same rate as prices. Usually if inflation is high, then interest rates will rise. If inflation is low, then rates will lower to boost spending. Inflation is one of the main influences of interest rates. The RBA has set an inflation target rate of 2­–3% on average. Unemployment rate, which is the percentage of people employed in the economy. In a strong economy, employment will be nearing full employment. Gross Domestic Product Growth, which measures how fast the economy is growing and how much output the country is producing. GDP growth is measured in quarters. Business and consumer confidence, which measures the degree in which businesses and consumers expect the economy to do well. If people expect the economy to grow, then they will spend more. If they expect bad times ahead, then they will save more. How does the RBA affect interest rates? Well, it’s basic supply and demand. The RBA acts as a kind of a banker to other lenders. If they want to increase the cash rate, then they limit the amount of funds banks have available to borrow, so banks will have to bid up the cash rate. If instead they want to lower the rate, they will increase the money available to the banks, so there is more of it. The RBA influences all interest rates in the economy, but lenders can set their own rates in line with the cash rate. There are two types of interest rates: the cash rate (or nominal rate) and the real rate. As I mentioned, the cash rate is set by the RBA. The real rate shows you your actual interest rate by factoring in inflation. So, the real interest rate is calculated by taking out inflation from the nominal rate. Interest rates usually go down when the economy is slowing. When interest rates fall, borrowing gets cheaper. Loans become more attractive which means that businesses borrow more, increase production and create more jobs. People who were thinking of borrowing will bring forward spending by taking on loans, since it’s cheaper. The result: They spend more. When consumption rises, demand for goods begins to exceed supply, so inflation starts rising. Asset prices also tend to go up when interest rates are down, mainly because more money in the economy means more people buying homes or investing in the stock market. Yet lower interest rates also mean that savers get less money, the reward for keeping money in the bank decreases. A lower interest rate also decreases the value of the dollar in the foreign exchange markets. Meaning, the Australian dollar value drops compared to other currencies. This makes imports more expensive and exports cheaper, which boosts domestic production. In short, lower interest rates increase borrowing and spending, which in turn makes the economy grow and creates inflation. If the economy or inflation is growing too fast, then the RBA will most likely raise interest rates. This limits the amount of cash available to the banks for lending and usually slows down the economy. When the RBA announces a rate hike, it becomes more expensive to borrow money. Payments increase and people have less money to spend. The result is that consumption slows. Businesses also pay more for borrowing, which means that they will invest less and even stop any expansion or hiring of new employees. The stock market usually drops as they expect businesses will stop investing and there will be less money in the economy. The value of the dollar rises compared to other foreign currencies, which makes imports cheaper and exports more expensive. In short, higher interest rates mean less borrowing and spending, which slows the economy and reduces inflation. To recover from the 2008 crisis, central bankers lowered interest rates and even promoted never seen before policies like negative rates to increase inflation. Yet when you think about it, negative rates make no sense. It is the complete reverse of what interest rates are meant to do. Lenders are paying borrowers to lend out their own money. Borrowers receive a reward for taking on debt. Even with interest rates at record lows, inflation is not picking up. 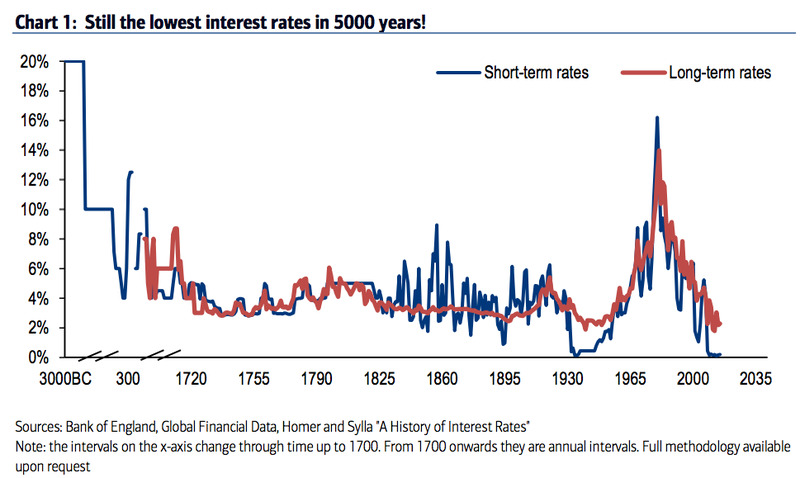 …and this is why you should be watching interest rates closely.